Valentia Observatory is located one kilometre west of the town of Cahirciveen in Co. Kerry. The observatory carries out surface and upper air meteorological measurements as well as a wide range of other measurements such as ozone monitoring, seismology and environmental monitoring. The reason it is called Valentia is because it was initially located on Valentia Island. The first ‘real time’ weather observation was transmitted from Valentia Island in Co. Kerry on the 8th October 1860 under the auspices of the Meteorological Committee of the British Board of Trade. The site was meteorologically important as it was situated in the path of most of the weather systems moving in from the Atlantic. 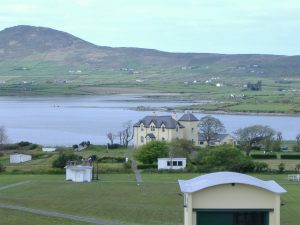 The Observatory was set up in a house leased from the Knight of Kerry at the Revenue on Valentia Island, in August 1868. The Observatory continued on the Island until March 1892, when it was transferred to its present location. The main Observatory building was called Westwood House and was built, in 1866. The British Meteorological Office continued to staff and fund the Observatory until December 1936 when the Irish Meteorological Service was set up. The British Meteorological Office ran the Observatory on an agency basis for the Irish Meteorological Service until the end of September 1937, when Irish Meteorological Service staff had been trained to work in the new Service. Many of the staff employed by the British Meteorological Office at the Observatory transferred to the Irish Meteorological Service. As well as fulfilling its national and international role within Met Éireann it is involved in many projects with other scientific bodies both in Ireland and abroad such as the Dublin Institute of Advanced Studies (DIAS), the WMO Global Atmospheric Watch (WMO-GAW) and the European Monitoring and Evaluation Programme (EMEP).The manual weather station at Valentia was officially closed on 1 April 2012 and was replaced by an Automatic Weather Station at the same location from 2 April 2012. On the same date, the number of daily radiosonde ascents reduced from 4 to 2.